With a self-proclaimed Ambedkar bhakt at the helm of the government, the Dalits might have expected a modicum of directional change in policies towards them. Instead, the two years of Narendra Modi’s government have led to a reversal of many of the gains made by the Dalits in the past few decades. Narendra Modi, the self-proclaimed Ambedkar bhakt, has completed two years of his boastful rule. Babasaheb Ambedkar, an iconoclast par excellence, was loath to having bhakts but with characteristic pragmatism, he might just have relented when a Prime Minister announced himself as his bhakt. Ambedkar had made a modest demand for Dalit representation in the state structure. He had hoped that such representatives would safeguard Dalit interests from the majority of the caste Hindus. Ambedkar experienced in his own lifetime the futility of his demand. But with an all-powerful Prime Minister as an Ambedkar bhakt, the Dalits could have expected a change in their state of affairs. A modicum of expectation that Dalits would have had from an Ambedkar bhakt would have been to turn the country somewhat along the direction prescribed by Ambedkar. It is well known that he had asked the new rulers to bring in social and economic democracy at the earliest. For this purpose, he had provided a vehicle in the form of the Directive Principles. Although not justiciable, they were to be the fundamental principles for governance of the country. But these principles were totally ignored in the 60 years of Congress rule. An Ambedkar bhakt would have been expected to get them back into focus. He was also expected to arrest the worsening conditions of Dalits. Two years may not be a long time to show visible results but certainly enough to mark a directional change. What does the Ambedkar bhakt have to show in these two years? On the eve of the last general elections, the Bharatiya Janata Party (BJP) upstaged the Congress by buying off all the prominent brokers of Dalit votes. This investment paid rich dividends. Enthused by this win, the BJP went full blast in appropriating Ambedkar through a propaganda blitzkrieg and grabbing all possible places where his memorials could be erected. Paradoxically, whatever Ambedkar stood for was being trampled upon with impunity. There was harassment and brutalities unleashed on Dalit students in higher education. There was deliberate delay in scholarships to Dalit students and institutional attempts to smother voices of radicals among them, eventually exposed by the institutional murder of a bright research scholar Rohith Vemula. As such, discrimination is nothing new to Dalits but the institutional manner in which it has been perpetrated in the past two years is certainly conspicuous. Despite countrywide outrage and struggles for justice to Rohith, Modi continues to back his killers. Modi swears by the Constitution as his sacred text but in the past two years he has trashed it. He has not only neglected the Directive Principles but has also not hesitated to mutilate them. Leave apart the spirit of the Constitution, its key guiding principles like secularism, equality and liberty have become a travesty in the past two years. The basic principle of equality before law in the Constitution, the single biggest constitutional solace for the poor and marginalised, has been almost dismantled as evidenced by the clean chit to the Hindutva criminals in Malegaon blast case. Ban on beef eating, ghar wapsi, saffronisation of education, jingoist promotion of nationalism/patriotism and irrationality are directly detrimental to the Dalit interests. All these are effective reversals of all gains made by Dalits during the last century. We will see how deprivation of Dalits has increased during Modis rule by looking at the budget allocations for two schemes: one, their overall development vide Scheduled Caste Sub Plan (SCSP) and Tribal Sub Plan (TSP) and, two, through the safai karamchari-related schemes. The Constitution recognised the need to close the socio-economic gap between these communities and the rest of the Indian population and mandated special protection and provisions for the Scheduled Castes and Scheduled Tribes. It was actualised in prospective terms only in the Fifth Five Year Plan period in 197475 by the policy of the TSP and later in 197980 in the Sixth Plan period by the Special Component Plan (SCP), later christened as SCSP. They were the statutory allocations to be made in every budget, central as well as state, to be spent on these communities and were mandated to be budgeted in plan outlays in proportion to the population of the two communities. As in any scheme for Dalits, the government never kept its promise. Most of the funds were diverted to unrelated activities and even then the actual spending was far less than what was budgeted. Even with such misdoings, the allocations by the previous regimes look better than the two budgets (201415 being the interim budget) of the Modi government. As Table 1 shows, for the year 201516 the ratio of the SCSP allocation to total plan outlay worked out to just 6.62%, by far the lowest since 200708 and that for the TSP at 4.29%, lowest since 201112. These ratios should have been 16.62% and 8.6%, respectively, as per their population. Although, in view of the important state elections, these ratios improved slightly in the current budget to 7.06% and 4.36%, respectively, they were lower than the earlier ratios. In these two years Modi has deprived Dalits and tribals of `13,370,127 crore and `5,689,940 crore from their legitimate share. Safai karamcharis, or manual scavengers, accounting for about 10% of the total Dalit (SC) population, are the Dalit among Dalits (Dalits Cry on the Eve of the Ambedkar Festival, EPW, 7 May 2016). Modis concern for this section of the population is evidenced by the drop in the allocation for Self Employment Scheme for Rehabilitation of Manual Scavengers from `557 crore in the last two budgets (as Table 2 shows) to `439.04 crore and `470.19 crore, which were further slashed to a token entry of `10 crore. The allocation for Pre-matric Scholarships to the Chil dren of those Engaged in Unclean Occupations shows an even more dismal picture: while the budget allocation was marginally raised to `10 crore from the earlier `9.5 crore, it was slashed to `2 crore in the last budget. While the BJP desperately depends upon Dalit votes, its win in the last elections with a clear majority in the Lok Sabha for the first time, coupled with the overbearing style of Modi, has bolstered the entire Sangh Parivar. Its aggressive Hindutva rhetoric generally emboldened the feudal forces and lumpen elements in rural areas to suppress any assertive action by Dalits. Not everyone in the Sangh Parivar internalises the tactical need of the BJP to woo Dalits. Such dynamics have aggravated caste contradictions in villages which often manifest in gory atrocities. While the atrocity graph has been going up sinc e the economic reforms were instituted, the rise during Modis rule appears spectacular. The National Crime Records Bureau has only the 2014 atrocity figures, but they might be enough to reflect the nature of this dynamics. 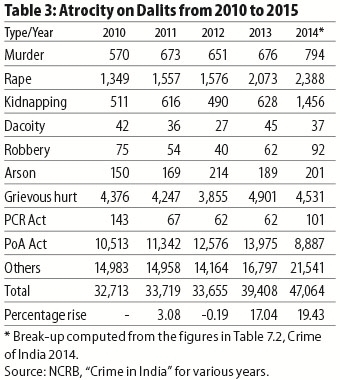 Table 3 gives a glimpse into the atrocities on Dalits, which shows an alarming increase of over 19% from the previous year. In sum, the two years of Modi have been grossly devastating to Dalits in the short term and utterly ruinous in the long term. Dalits had better realise that the Sangh Parivars dream of establishing Hindu Raj, a curious cross of the Hitlerite Ein Volk, Ein Reich,Ein Fuehrer and Manus Brahmanism, is a deadly antithesis of Ambedkar.